The Connecticut River is the heart, mind and soul of an entire region. Its Valley is an important birthplace of American art, spirituality and economic power. Over the next year, Writers Voice will air a six-part series exploring the literature, spirit and meaning of the River. Each episode of The River Runs Through Us will cover a single theme by drawing on different disciplines in the humanities — history, fiction, journalism, performing and other creative arts. Go to the series page here. Tell Us Your Stories: Email us your own stories about the Connecticut River and its meaning for you. We’ll ask some of you to be guests on Writers Voice to tell your Connecticut River stories to listeners. Comment on The River Runs Through Us through social media with the hashtag #wvriver. We’ll publish the links on the series webpage. Kerry Buckley is the Director of Historic Northampton Museum and Education Center. 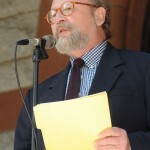 He is an expert on the history and culture of the Connecticut River Valley and edited the essay collection, A Place Called Paradise: Culture and Community in Northampton. 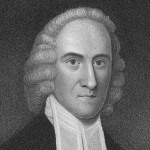 His articles and reviews have appeared in The New England Quarterly and The Journal of American History. 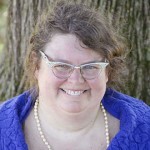 Susan Stinson is a novelist, historical tour guide, writing coach, speaker and the Writer-in-Residence for the Forbes Library in Northampton, Massachusetts. She has published three novels and her recently completed fourth, SPIDER IN A TREE (Small Beer Press, Fall 2013,) is a historical novel about the life and family of influential 18th century Calvinist theologian Jonathan Edwards. The novel is based in Northampton, Massachusetts, set on the banks of the Connecticut River. Stinson is a long-time resident of Northampton. In Spider in a Tree, Stinson uses the Connecticut River as a central spiritual theme in the lives of her characters. Drawing on her daily contact with the same landscape and surroundings of the Puritans, she creates a deeply evocative journey of spiritual discovery with this novel. WV talked to Susan about her deep connection to the land and the river, the spiritual connection that the Connecticut River creates between the past and the present, and how the river rooted her work in spirituality. The River Runs Through Us is funded by a generous grant from Mass Humanities.